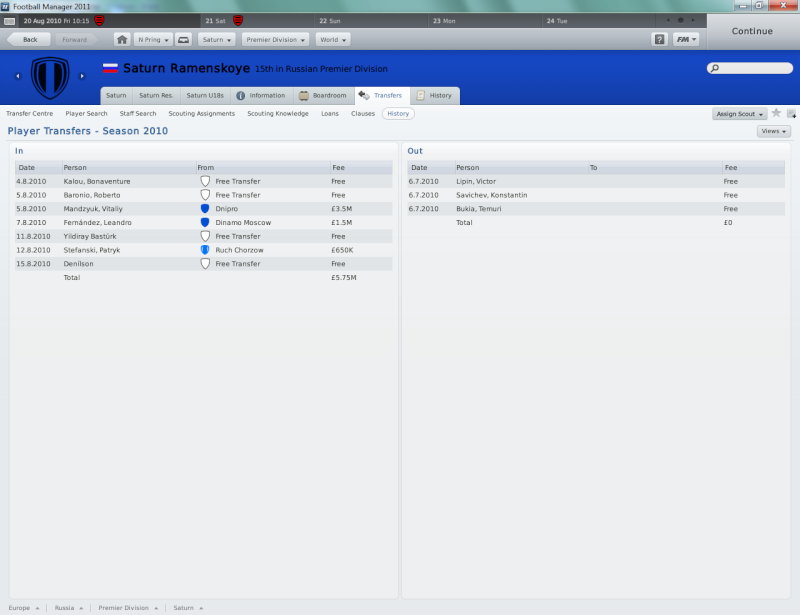 After just one month after gaining my UEFA Pro License, I was given the chance to save Russian Premier Division side Saturn from relegation. I agreed to a 6 month contract, which will tide me over until Christmas, when the proper jobs become available and I was given a pretty decent £12.5m to spend on fresh faces for the squad. With hopefully Afonso Alves coming in for £1.5m. My first task was to have a look at the players at my disposal, and having recognized a few familiar faces, I thought this is easily achievable. After just 6 hours in charge at Saturn, I had my first game, which had to be a crucial one for me. We was at home against Krylja Sovetov, who are currently 5th. We found out why their flying so high after just 8 minutes in, when Juan Carlos Escobar scored a screamer to put the away side 1-0 up. Saturn had pressed and tried hard to find the equaliser but it just wasn't going to happen. We ended up losing 1-0, which I was pretty disappointed about, as I thought we could have had a point by the way we performed. Our next game is against Dinamo Moscow at home in the Russian Cup, another tough game, but hopefully, I'll have the squad where I want them by then. So the big game has arrived, and although I had a bit of a nervy feeling, I felt pretty confident that we could get a point. We started the game with a more controlled look to the team, but this was quickly undone as Alexandr Semedov smashed in a 5th minute goal to put the visitors 1-0 up. We absolutely dominated the next 40 minutes up to half-time but still found ourselves 1-0 behind. I gave them the 'We can win this, lads' team talk, and they came out like they came in. Straight on the front foot, and pushing the Moscow side back. After just 6 minutes, Andrey Karyaka had pulled it back, it was 1-1, and I knew now that we had a great chance. 13 minutes later Saturn centre-back Dmitry Grachev scored an header to put the hosts 2-1 up, and with time ticking away, I made a few changes to waste a bit of time. But on the 89th minute, Dinamo Moscow was awarded a dubious penalty, in which Denis Kolodin would step up and see his penalty saved by Saturn goalkeeper, Antonin Kinsky. This handed Saturn the three points and an incredible victory. Things were about to get a lot tougher though, as Spartak Moscow were coming on the weekend. So I begun to train the side ready for the big-game on Saturday. The game started much better than my previous two, as we held out for the entire first half at 0-0. I thought we may finally get the win here, until Welliton slipped in Alex, who rounded the keeper and made it 1-0 to the visitors. Saturn struggled from this, and we found ourselves craving an equaliser, however it did not come, and we eventually lost 1-0. After the game I was quizzed about my future at Saturn, and if I thought I could turn it around, I replied 'Of course'. I then noticed that my Saturn side were travelling to Moscow next weekend to play third place CSKA. I was literally browning my pants, as I felt this could be the game where we are completely opened up and ripped to pieces. The game started in a great fashion, as we showed we wasn't afraid of them, and on the 11th minute, Alexandr Sapeta grabbed a goal for us, we were 1-0 up at CSKA Moscow. I thought I'd leave it a bit and see how things go, and would you believe it, Sapeta notched in another one, as we went in at half time 2-0 up. I told them how pleased I was, and how we need to keep this up, I also told them to keep the ball, and make CSKA work to get the ball. On the 73rd minute, former Manchester United winger Zoran Tosic scored a sensational goal to take the game to 2-1. The last 15 minutes or so were very twitchy, as I feared we would collapse and let them back in to the game, and I wasn't wrong. CSKA dominated the last 15 minutes, and probably should've won the game during this time, had it not been for Antonin Kinsky, who had an absolute blinder. We somehow managed to maintain our performance for the injury time, and we sealed an amazing 2-1 win at the home of CSKA Moscow. Next up is a relegation battle against Amkar Perm away. I hope I can build on the last game and secure another massive victory for Saturn. Good luck with Saturn mate, you must be on another planet to take them on!! Still, could've been worse......you could've had a hard job at Uranus! Very good start pringers and well written too! 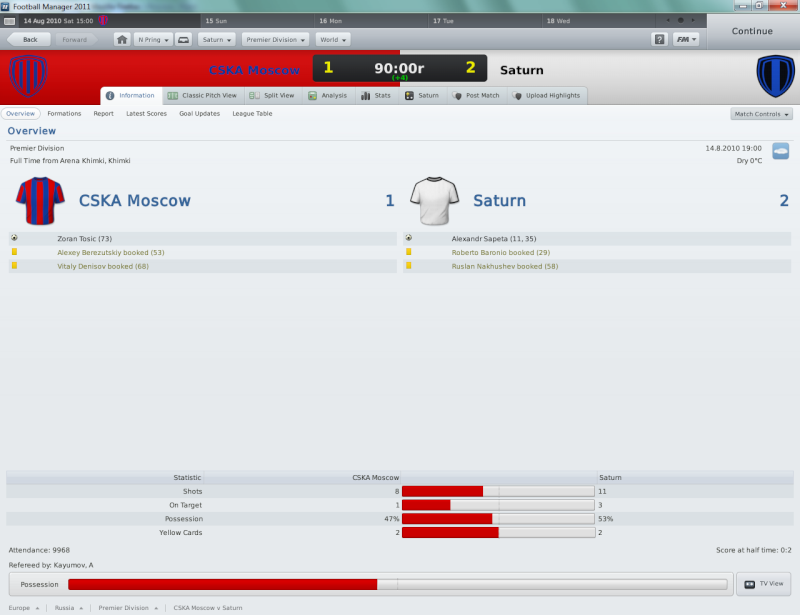 In what was billed as a crucial relegation battle match, I felt Saturn had to win to even stand a chance of staying up. I knew it wouldn't be easy as I know Perm is a very hard place to go. We started the game with confidence especially after we won in Moscow last time out. The game took a dramatic turn and we found ourselves 2-0 down after an hour. I made some changes and managed to get one goal back before the final whistle. A 2-1 defeat at relegation candidates Amkar? Surely, that's the end of Saturn. One week later, Russian Premier Division league leaders and current champions Rubin Kazan came to Saturn loooking to get all three points to take one step to retaining the league title. Saturn had other things on their mind, as new signing Denilson tore down the left wing and smashed in a delightful finish to put the hosts 1-0 up. With just 15 minutes ago, I thought this was going to be a memorable result, but Obafemi Martins headed home to secure a 1-1 draw. After this draw, we had to travel to St Petersburg to play the in-form team of the Russian division. I knew this would be a long shot, but I stuck with the same team, and hoped that I'd get something. We were completely destroyed by Luciano Spalletti's men, and we lost 2-0, although it could've been a lot worse. A few days later we had fellow strugglers Alania at home, I knew we had to win this one, but they were a match for us, as we struggled to secure a 1-1 draw. The away side probably deserved to win the match, and at this point, I thought relegation was a certainity. There was good news in the next match which was away at bottom placed FC Rostov, as Saturn smashed a 2-1 win in Rostov. This meant that FC Rostov were practically relegated, and only one more team would join them. Would it be Saturn, Alania, Amkar or Tom Tomsk? We then hosted Spartak Nalchik, a game I thought would be an easy victory for Saturn. However, Spartak upped their game and they took us by surprise and secure a 2-1 win. The final spot was again looking to go to Saturn and to Nicholas Pring. And with an away game at Dinamo Moscow, and an home game against Tom Tomsk, I knew 4 points were on order to give us a chance. Alania had already lost by the time we played Dinamo Moscow, and I don't know what it is, but Dinamo Moscow struggle against Saturn. We went to Moscow, and we again stole the show, and took a 1-0 win. A few days later, Tom Tomsk came to us, and although the visitors controlled the game, Saturn took a 2-0 lead at half time. Tom Tomsk got one back in stoppage time but that was enough for Saturn to take all three points. 6 out of 6 meant that we had moved out of the bottom two for the first time since the start of the season. We then drew the next four league games against Sibir, Terek, Lokomotiv Moscow and Anzhi. This put us four points clear above Alania, who had now been relegated, which means that Saturn were safe. 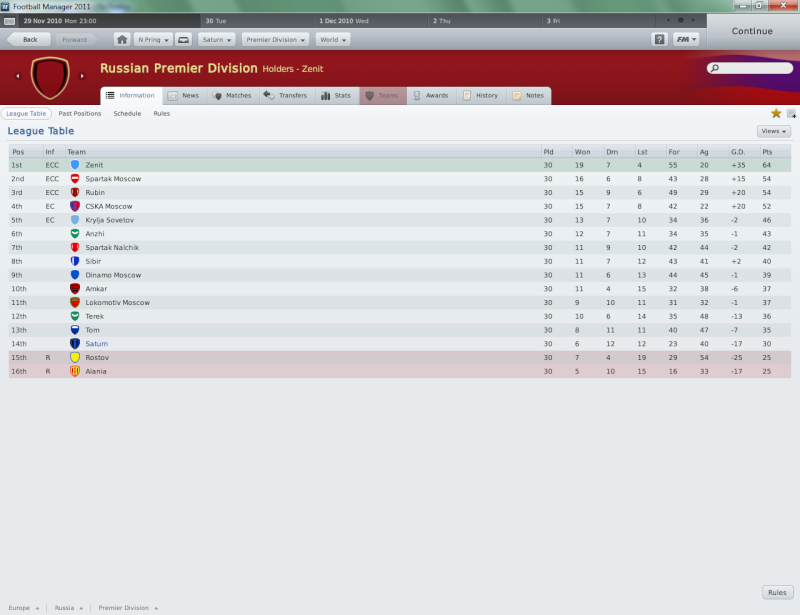 I had done the unthinkable and managed to keep the Russians in the top flight. The final game of the season was away Krylja Sovetov, in which we were absolutely destroyed in the first half, and found ourselves 3-0 down. We managed to steady the ship and lose 3-0. So I had done what I was brought in to do, and felt that was enough for me. I have decided to leave at the end of my contract which is in December, which will open myself up to a vary of offers. I hope I can get a better job than Saturn now. Well done on staying up mate, hope you do get a better job that one was hard to keep them up, but the challenge is there to improve there team. Fantastic results against Dinamo it seems were key in keeping you up! You'll be glad Dinamo's bogey team are Saturn eh? Hope you manage to sign for a bigger side than Saturn, but fantastic job on keeping them up mate!